I don't think I mentioned it here, but we had a big weekend here. Matt was ordained (he's a Baptist minister for real now, and that makes me a real minister's wife) and we also did a parent/child dedication with Cadence. Lots of extended family was in, and we hosted two big meals at our house. It was really great to see how supportive our family and, more importantly, our church was for us at this time. 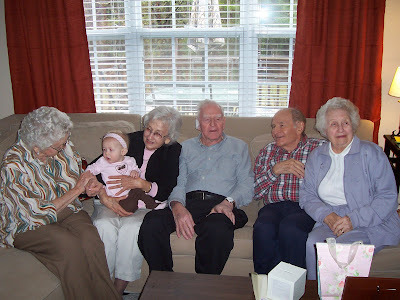 Cadence had 5 of her great grandparents visiting. After everyone left on Sunday afternoon we all crashed, but Cadie looked really cute doing it. What a Blessed and Happy day. Our little Angel was all tuckered out but she was so good through it all. We were so very Blessed by the whole event.